Stop the Incline, or Start the Spur? I’ve had this essay in draft form for a while now. With the Re-Imagined exhibit being shown for a second time, and a recent Facebook post and a group forming called Stop the Mount Beacon Incline Railway, I thought I’d post my thoughts. It can be seen at Hudson Beach Glass from February 1 through March 9. 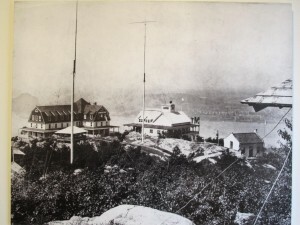 A similar presentation was held this past summer at River Center Long Dock as one of Beacon’s centennial events.The current iteration of the exhibit also includes a quick look at the Hudson Fjord Trail and the Beacon Loop, but the main attraction here, as at the version presented earlier, is the Mount Beacon Incline Railway Restoration. 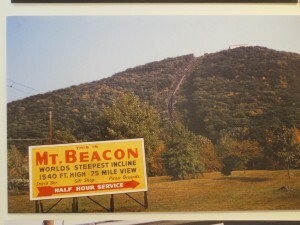 The general outline is by now familiar to many Beaconites—opened in 1902 as the world’s steepest passenger incline; popular tourist attraction, featuring a hotel and casino on the mountaintop, that peaked in 1926; struggling to survive in the following decades, finally closing in 1978 for failure to pay taxes; gutted by a massive and suspicious fire in 1983; restoration society founded in 1996, lately picking up influential board members and political support. Drinking, dancing, and of course sleeping, at the Casino on top of Mt. Beacon. No doubt it was a thrill–but there is a thrill in climbing to the top as well. When the Incline opened 112 years ago, it was truly an engineering marvel that could bedazzle a public that had never seen a city from an airplane or watched men land on the moon. During its most popular years, it also featured dancing, drinking, and overnight accommodations. Then came the Depression, then World War II. But what really finished off the Incline was the automobile. No longer were day travelers confined to where the steamship or train could bring them. Now they could wander “off the beaten track” and there were more interesting things to see than a quaint tram car that went up the side of a small mountain. No doubt somebody did a study to come up with 192,000 visitors annually for the restored ride. But once at the top, they won’t be drinking or dancing, they’ll be watching interpretive videos of what they missed by taking a 4-minute ride up the mountain instead of hiking up in 45 minutes. And eating at the restaurant and shopping at the gift shop. I am not convinced that the public will flock in the projected numbers, or for any sustained period of time. Proponents have made much of the fact that not everyone is physically able to hike up the mountain, and restoring the railway would give access to all. True, but following that logic, why wouldn’t we also be obliged to put an incline up Breakneck Ridge? In terms of panoramic Hudson Highlands valley views, there are spectacular, car-accessible lookout points across the river on Storm King. For those who would champion people with disabilities who want to get to the top of the Fishkill Ridge, why not start a Mt. Beacon Access campaign, buy a motorized all-terrain wheelchair or two, and set up a local organization that would work along the lines of Bicycling Blind. That group connects sited captains with blind stokers to ride tandem bicycles together. MBA would have a list of volunteers (two per wheelchair) who would be willing to partner with a wheelchair user to hike up the fire road. That’s kind of general, but I did learn from the brochure that the parking surfaces will be permeable and the area around the parking will feature native trees and shrubs that will reduce CO2. While the design elements are laudable, adding roughly 200 more parking spaces in Beacon is not the road to sustainability, even with LEED (Leadership in Energy and Environmental Design) certification. With the Craig House property up in the air, the existing residential Polo Fields and Preserve on the Hudson, the 248 Tioranda project making its way through the planning stages, and likely increasing use of University Settlement Camp, we’re suddenly ripe for a road widening at that curve where Howland Avenue merges into 9D, maybe a stop light, certainly much heavier traffic volume encircling our city. Several times in the video, we hear that this will be a “world-class nature park” and not a “Disney park.” Toward that end, plans include a lower park and visitor center with program and meeting space, exhibitions, and retail and food services; a network of meticulously maintained hiking trails; onboard interpretations of scenic views; an interpretive observation area with indoor and outdoor panoramic views; walkable green roofing; a top-flight yet affordable restaurant; being immersed in an unparalleled Hudson River Valley experience. If Walt were alive today, I’m betting he’d be all over green and sustainable nature parks. In 1902, the country was just starting to crank up its industrial phase, and the Incline Railway was a sublime expression of that national drive, the drive to make nature beholden to man, to serve up its pleasures to us, whether mineral, animal, plant, or scenic view—and why not in comfort, while we ride this train to nowhere we’ve laid up the mountain. I like this shot, the color, the composition. Another Roadside Attraction! Is our relationship with our environment served better by interpretive talks and videos, or by experiencing it without the technological interface, the manicured trails, and the gift shop? (Visitors spend an average of three hours in Grand Canyon National Park—half an hour to view the canyon and two and a half hours in the gift shop. While we’re on the subject of the Grand Canyon, what about a mule ride up Mount Beacon? Kinda almost serious. That’s how the Incline builders hauled all the materials up when building the original.) Do we honestly believe the next 20 years will be about tourists looking to take a trolley up a small mountain? What about the next 50? Unfortunately, as we continue to learn, despite the inspired Latin “Excelsior” on the New York State Seal featuring our mountain, things do not go “ever upward” (with atmospheric C02 levels and Wall Street chutzpah the exceptions that prove the rule). Certainly if the railway were still in operation and needed a million dollar facelift I would not be opposed. I believe in many ways the idea to restore the Incline is a noble and worthy one. The effort so far has involved many talented, intelligent, civic-minded people. I’m not even advocating for a Stop The Incline movement, and I apologize to all those involved if my points of contention come across as harsh. But I do have a suggestion, one which would only necessitate a slight adjustment of the currently proposed plans. The old Matteawan Station was for sale several years ago. If the City only had money…great place for the Historical Society. That would be to grab the Incline, pull it down the side of the mountain, and place it alongside the Fishkill Creek. In a metaphorical sense. Yes, I speak of taking that $20 million dollar goal and all those excellent ideas and that civic spirit and applying it to ye olde spur line. The only local transportation idea brought up more frequently is the aforementioned shuttle. In fact, Mayor Casale campaigned on this rail line. Done correctly, this would still be an economic engine. For instance, tourists are flocking to Greensburg, Kansas. Now imagine Beacon has designed a duel mode vehicle system that runs along the creek from the train station to Fishkill (with shorter trips intermittently), then hops off the track and drives back down Main the other way, or a rail car that simply runs back and forth from the east end to the waterfront, with some longer runs to Fishkill. This would accomplish a number of positive outcomes. It would be a tourist attraction in itself, and would help bring more existing DIA visitors to Main Street. It’s true, just having a convivial, 25 mile per hour railway car making its way along the creek would bring people to town—via boat or train, no need for a car. A stop could be made at DIA. 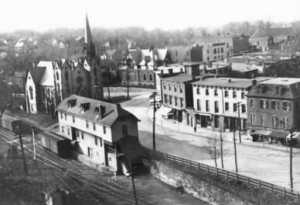 The Matteawan station would be the town stop, enabling visitors to walk from the east end of town back down Main Street. It would make the town more walkable and more livable by helping to reduce traffic and reduce parking requirements. Over 400 units are currently planned along the creek. Right now each one could bring in one to two more cars per unit, but if the spur line were running, parking could be unbundled from the units, Zip cars could be used, and the units could be marketed to New Yorkers and other urbanites who could continue with a car-free existence. It would still be there when the party’s over and the tourists have gone back to their own homes to grow turnips, still be contributing to our local economy, still be used by the citizens of Beacon. And because it would not be a full-scale, heavy train, the track renovations and future maintenance would not be as expensive as a full-scale railroad operation. 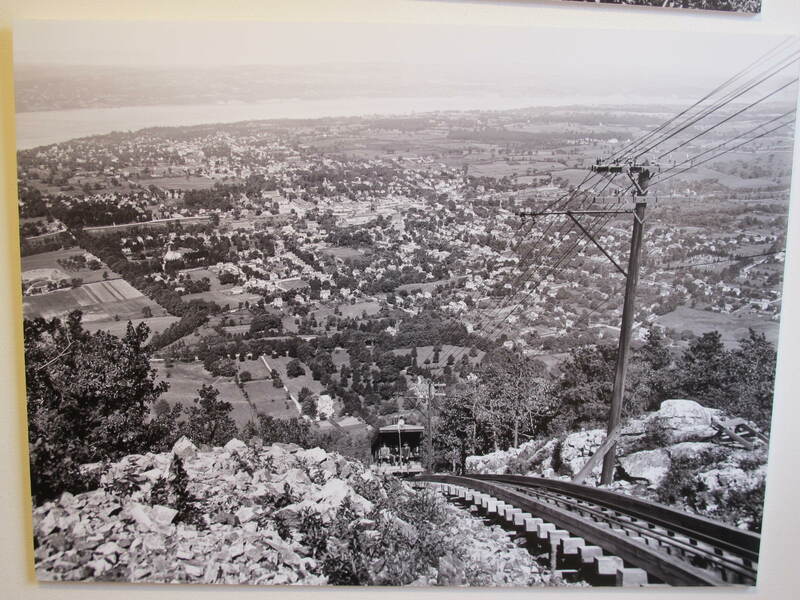 The Mount Beacon Incline Railway made sense in its day, but that day is gone. 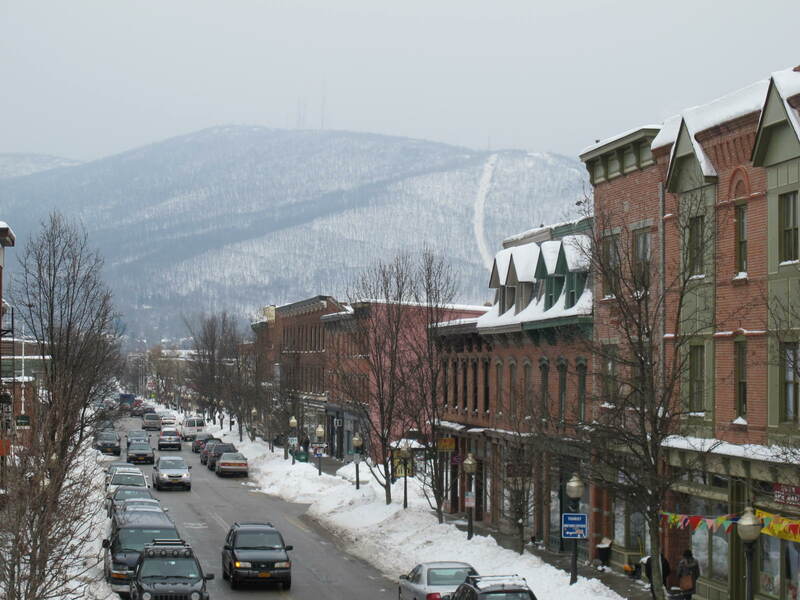 Re-imagining the Beacon Spur Line is a true vision of Beacon’s future. 9 Responses to Stop the Incline, or Start the Spur? I’m replying to Ben down here so that my reply doesn’t turn into an ee cummings poem. He askes “ironfish:Who are you?” I was having trouble with my admin settings, finally decided to fix it. I am the site owner, Mark Roland. First, the zeal to promote bicycling and walking is not the end in itself–those modes of transit have repeatedly been shown to improve local economies. They also improve a person’s enjoyment of place, and the infrastructure requires less maintenance. Second, “concept at its core” is all fine and good, but it did not get translated in any way to the design specifications presented by MetroNorth. Third, the M.T.A. showed zero interest in working to modify the design, and in fact petulantly picked up its marbles and walked away from the table. I like this critique. I’ve seen the presentation twice now and remain skeptical. I’m particularly worried about the parking/car situation. And I love your idea about putting the $ and time into the spur to Fishkill which would seem to be much more productive for linking the region overall and actually reducing car dependence in the area. Thoughtful article. It does seem anachronistic. Could we use that money in better ways (i.e., getting DIA visitors up to Main St.)? The biggest advantage I could see would be better policing of the trails to prevent ATVs from ripping them up; once big money is involved on the mountain, entrepreneurs won’t stand for it, but that could happen without the railway if there was political will. For now, Randy got a definitive “no” on the concept from the M.T.A. last year so the diea is as dead as a doornail. My approach would have been to package something with the T.O.D. The T.O.D. is an excellent idea as it anchors people in Beacon with no need for cars. But, some people opposed that. I still don’t understand why. No such thing as a dead as a doornail idea, especially when it’s a good one. MetroNorth is a public benefit corporation chartered by the State of New York, so they will eventually be made to respond to political pressure. The TOD (Transportation Oriented Development) as presented to the City by MetroNorth was all about a lot more cars, not less. The City recognized this over time. How does a development of people attached to a transit station result in more cars? What I’d like to do is revisit the TOD, as part of spur development. 1. Beacon’s parking lot disappears, multistory residences take the place. Some shops, not a lot. The current site is a weedy lot with it’s own dedicated third rail line terminating at an old industrial site. Voila: better long distance commuter access, less cars in Beacon, more residents in Beacon beholden to Beacon business by foot/ bike. Ben, I’m not sure where you were when all this was discussed for well over a year, and the mayor and the council, as well as the county planner and other urban designers, all agreed that the proposed “TOD” for Beacon’s waterfront was not going to do what TODs are designed to do. You might look into it. I was there for many meetings. There were concerns were sight lines: interfering with views, a fair criticism. And concerns about new businesses on the waterfront displacing Main Street businesses, too much retail square footage. Another real problem. The plan also included expanded parking: a multilevel parking garage, if this is what you are referring to. But the proper approach would have been to *change* the T.O.D. to shunt cars elsewhere, and use the T.O.D. to get leverage for spur development. But instead a vocal minority insisted the whole thing be opposed. And this is why we stand nowhere with nothing today. If we are ever to revive the T.O.D. (still a good idea) and the spur some years from now we have to get our act together on what a T.O.D. really means when it comes to cars right now. And I am completely mystified how a development tailored to transportation *by train* is such a horror to those who oppose the proliferation of cars, as I also do. And as I properly understand a *transit* oriented district to be all about. I really do not comprehend people who in their zeal to promote bicycles and walking would oppose rather than modify an idea that has that very concept at its core. A T.O.D. centers around transportation by rail. It baffles me that so many insisted on shutting down the T.O.D. rather than working with the M.T.A. and getting what we want out of the spur. I am am just around the corner from the base of the Incline and I am not sure how i feel yet. There would be a couple of benefits that I can see immediately. It could be a huge draw for Downhill Mountain Bikers. Tom C. can correct me if I am wrong here, I think I heard Director of the the Hudson Highlands and Fahnestock Parks Bill Bauman(sp.) talk about making a few dedicated trails for bikers only, that would terminate at the state property to the south of the Settlement Camp. It could also open up some downhill skiing opportunities a la “Ski Dutchess” every few years when the snow pack allowed. I also think The Incline Society should go big with the selection of who would design the summit structure. I know they have a local architect picked out but this is a once in a life time spot for a structure. Go with a world famous architect or an artist of DIA caliber working with an architect. So that the structure becomes a must see mecca. I don’t see this working other wise.